A few years ago I proposed that we stop wireframing everything and that we do some sketches and then prototype. I’m really glad the message has got out and people are considering that wireframing is just a transition to the prototyping. However there is still a good number of issues when designing to support a good user experience that we need to get rid of. We have become oppsessed with the artefact – the final report or diagram. A good deal of resources is just wasted producing them. Well I can tell you they are not important. We need to take a lean approach and stop producing them. These 400 page reports and pretty diagrams are the issue. We have created a world where we have an excess of reporting. Where is it now expected that management will front up to the executive with an expensive looking report to show how “busy” they have been. Partly this issue has it’s roots in our outdated concept that “more hours worked” = “greater productivity”. We now know that to be complete crap. On most projects the UX is never really considered ideally, at some point there is always a compromise taken. This is usually due to lack of resources (budget). Now what would happen if you could find, 10%, 15% or maybe 25% more budget for supporting a good UX, clearly you could use that extra budget on those techniques and methods you discounted to confirm you design or research. What if doing all those pretty reports was taking 25% of the budget. Would you question why they are being done. Now I get that from a consulting basis the big report or the pretty diagram is usually an end of line item, a solid deliverable for the client. Something you get paid for. I live and work in this UX consulting world, so I get that. I have to produced these reports or diagrams that very pretty and extremely over detailed, just so the client felt like they got their moneys worth. When in reality the money was spend on knowledge transfer previously with their team. Also the reality of the matter is only the summary of the report is ever read. Maybe as consultants we need to be looking at producing a MVP in the form of the usual pretty report. So why bother with the Artefacts of the Process? If we took all the extra effort and redirected it back into the project surely that woud be of benefit. The entire point of the final products, is really just to focus the team on the information or design and start a conversation or feedback. The conversation can be from customers, stakeholders, product owners or colleagues. 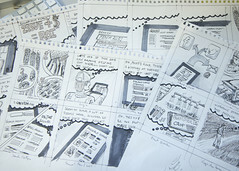 Now if you are working solidly on a project, then you will be constantly sketching, researching or the like. Producing low-fi items, that can help serve as daily discussion points. As opposed to the traditional “over the wall approach” when we hid ourselves away to produce wonderful shelfware reports. It’s just a matter of the way we are working. What if we just used those sketches, the workshop posters, that review video of the testing session. What if we kept the reporting artefacts to the core of the information with maybe a summary of findings. It’s this discussion that is the important aspect, the information that comes out of this discussion: the requirements, issues, directions, possible solutions – these are the important aspects. Not the pretty outdated management reports. To often it’s these comments or discussion points that are forgotten or put aside with our headlong obsession to produce 400 page reports on the matter. We need to change the focus. What better place than at the source. Stop producing the shelfware and focus on greater productivity for the project overall. Get the team collaborating effectively. Keep the outputs lean. Generate the discussion and move the project forward.